This self-watering indoor planter makes it super easy to enjoy plants in your home or office—and keep them thriving—with very little effort on your part. Drop a store-bought plant (still in its plastic pot) into the modern-looking planter and fill the water reservoir. That’s it—your greenery is good to grow for up to 12 weeks. How easy is that? Dimensions: 6.5" x 6.5" x 7.75"
I travel and this helps me not to worry about my plants, I make sure it’s filled and off I go, when I come home the plants are still healthy. LECHUZA self-watering indoor planters make it easy as it can be for plants to flourish in your space—with close to no effort on your part. Each planter has a built-in wicking system that will water plants for months. Fill up the reservoir and a plant is good to go for up to 12 weeks. An indicator lets you know when it’s (finally!) time for a refill. Besides the ultra-low maintenance watering routine these planters provide, they also eliminate any repotting. Just place a store-bought plant in as-is. 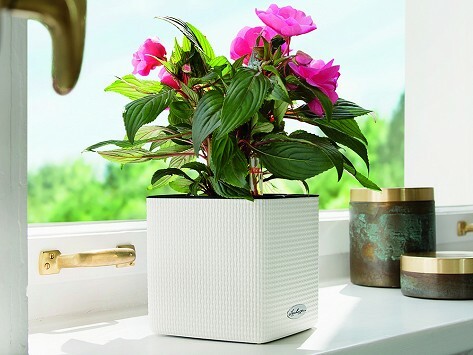 With the guesswork taken out of the equation, plants will thrive even if you don’t have a green thumb—or if you’re often away from home. LECHUZA planters are made in Germany by the Brandstatter Group. Their clean design aesthetic and work with injection molded plastics result in a modern finish that works in just about any space as it brings some green inside.